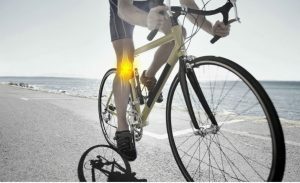 The majority of cycle related injuries can be due to a number of bike and human variables such as overuse/ overtraining, previous injuries, poor technique, incorrect bike fitting to name a few. A study from Norway (Clarsen et al 2010) interviewed 109 professional cyclists and identified that out of 94 injuries 46% had lower back, 23% knee and 10% neck over the previous 12 months. Knee problems are not as common as lower back pain but are more likely to cause time off the bike then any other injury. The cleat placement is fundamental to the knee position as well when a saddle is too high, low or too far forward or back. The extended position of the knee at the bottom of the pedal stroke is paramount to a bike fit and the subjective feeling of the cyclist and the observation should be one of smoothness. The recommended knee positions over pedal and the advised angles are an area of controversy as there is no significant evidence to support them. Ultimately we are all individuals of varying sizes and shapes with different upper, lower limb and trunk ratios. 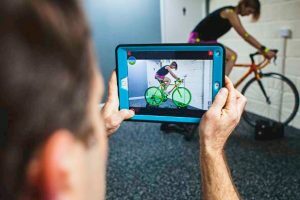 As a bike fitter and Physiotherapist the key is too have good observational skills supported with video analysis, but crucially constantly assessing feedback from the cyclist during the bike fit process. available to all abilities and is not reserved for the cycling elite. At bikefly we are fortunate to be able to work closely with Steve Harrop at skyhookcoaching , a professional cycle coach. Ultimately having some specific structure to your cycling improves you both physically and mentally and more importantly prepares your body for the year ahead. 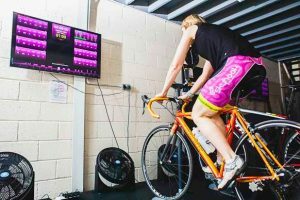 This is the time to get a Bikefit and Physiotherapy review to get rid of those niggles and perhaps now is the opportunity to optimise your winter training with a structured training programme specific for you. loads whether they are more or less. A bike fit should reflect these changes of flexibility, weight changes and fitness. changes that may have occurred to you or your lifestyle, even if it is the same bike you have ridden for years. Cycling has become increasingly popular in the UK over the last 10 years due in part to the success of the British Cycling team in major competitions as well as British cyclists such as Bradley Wiggins and Chris Froome winning the Tour de France. 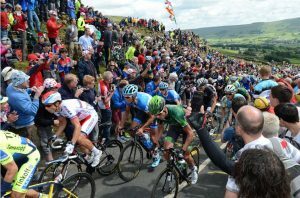 The amount of people interested and participating in cycling has surged in the Peak District and Sheffield areas following the Yorkshire Grand Depart of the Tour de France in 2014. Choosing a bike is no longer a simple process as there are many different brands and types of bikes depending on the terrain you want to cycle on such as road, trails, cross country or sometimes a combination of these and whether you want to compete in triathlons, road races or the increasingly popular sportives. If you are new to cycling and want to see if it is something that you will enjoy then the best option is to buy an entry level bike that is both reasonably priced but at the same time is still a decent bike. You will often be able to research what bike is right for you and check out reviews online. The more you spend the better the components and lighter the frames can become, but this is not always necessary when first starting out. A lot of bike shops will have demo bikes and this is a really good opportunity to get a feel of the type of bike you want. Often the hire of the demo bike will be taken off the purchase. Each genre of bike will have different specifications and differences within that genre for instance a road bike will have variations between the front of the bike ( head or steering tube – see diagram). A shorter head tube will be for more aggressive aerodynamic riding and higher head tubes for longer days in the saddle. Choosing the correct size and type of frame is very important for comfort, efficiency and ultimately injury prevention. Ask yourself what position do you want to be in? Bicycle companies have different sizing methods but mostly they are either a range from small to extra large sizes or centimetre/inches measurements. Because many of the modern bike frames have sloping top tubes the effective top tube length eliminates this variation. The manufacturers frame geometries will always give an effective top tube length with each size of frame. All of the brands have basic size charts that you can view on line that also correlate your height and/or in inseam measurements to a frame size. Most brands will also have frames more specifically for females taking in to account anatomical variations such as pelvic and shoulder widths. 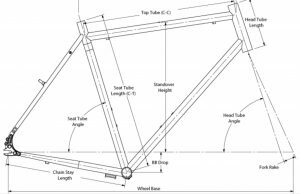 All of this information is useful in getting an idea of what frame size may be appropriate for you. Variations on stem lengths, crank sizes and types of saddles can sometimes be changed when trying out in the bike shop ( and hopefully after you have ridden on a demo bike) and before purchasing. The problem with a standard bike size and the components added are that they don’t take in to account the complexities of the individual human in motion and that we are all different shapes and sizes. For example two people can be the same height yet may have different leg lengths and more specifically different lengths of shin or thigh bones as well as varying trunk and arm lengths to name a few. 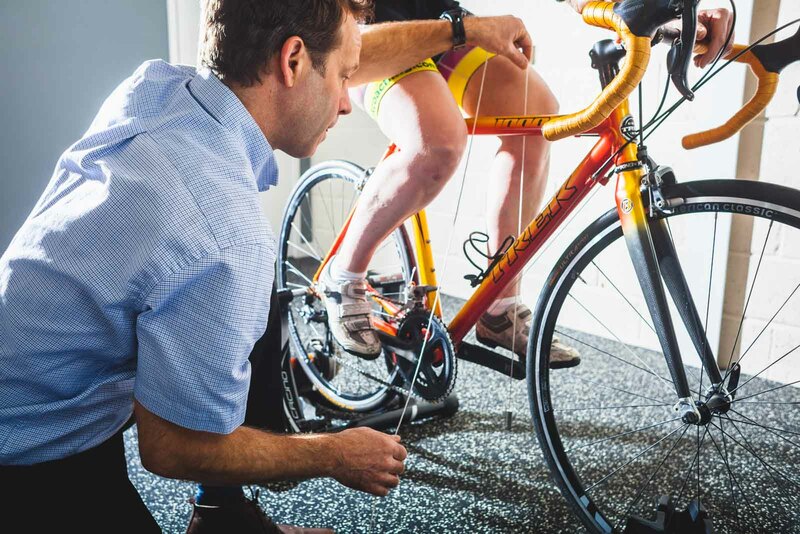 At Bikefly we know that a correct bike fit is crucial and this isn’t always offered at the bike stores but is necessary in preventing possible niggles, discomfort and injuries occurring as well as optimising efficiency and comfort on the bike. Cycling is a low impact activity but due to the repetitive nature of the pedalling action any small problems will be amplified and an injury or discomfort may occur. As you can see choosing a bike isn’t easy but it is worth the effort to get it right to optimise your enjoyment and hopefully enjoy a lifetime of cycling. Sheffield has a large cycling population partly due to the close proximity of the Peak District National Park with its abundance of winding country lanes and trails. This beautiful area attracts all types of cyclists consisting of leisure/touring, mountain biking, road cyclocross and triathlon. The repetitive nature of cycling has the potential to cause problems. When observing the statistics, competitive cyclists average up to 5,000 pedalling revolutions an hour, between 10-150 miles each session and up to 20,000 miles a year. It is therefore easy to understand that even very subtle irregularities with the bike or cyclist can manifest in to discomfort and pain and possibly time off the bike. 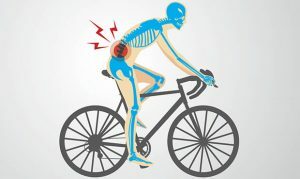 At Bikefly we come into regular contact with cyclists presenting with bike related and unrelated injuries or problems. The commonest injury prone areas we observe in cyclists are the neck, back and knees. A cyclists͛ flexibility and joint/muscle movement is fundamental to gaining particular positions when riding a bike. 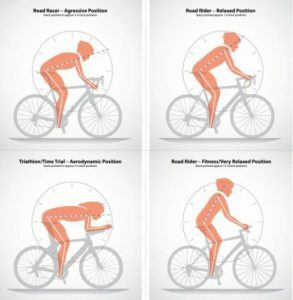 This is relevant if you are competing in a time trial where an aerodynamic forward position is required as opposed to a touring cyclist whom will require a more comfortable position for longer periods in the saddle. A series of physical tests combined with a musculoskeletal assessment is paramount in identifying irregularities and/or asymmetries that may be part or the main problem for discomfort, pain and time off the bike. There can be many reasons for the onset of pain in cyclists. Commonly we observe that the bike set up or bike fit is incorrect. knee. The list goes on from fitting cleats incorrectly in relation to the pedal spindle, as well asymmetries in hip, knee and foot alignments. Ultimately the bike should fit the rider and not vice versa. A bike fit is a dynamic process that will change over time depending on the amount of cycling you do and how the body reacts to training. Start your Autumn training with a correct bike fit and physical assessment at Bikefly and optimise your position and comfort.